It was suggested to me that I try belting my cotton dresses. My son picked out this awesome belt at Goodwill one day when we were there and INSISTED that I buy it. His favorite color is red. 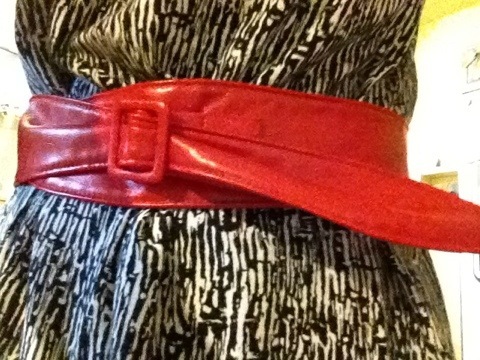 Belts at GW Fashions are $0.99, but this one happened to be the color of the day, so I got it for half price. This dress is a little (some might say a lot) big, but cinching it in with the belt makes it totally wearable. The “scarlet” belt gives it a little tie into Proverbs 31 and I was able to take the advice of my awesome readers. To see the rest if this outfit–and my other outfits from this coming week–tune in Friday for my Ladies Room Fashion Show!